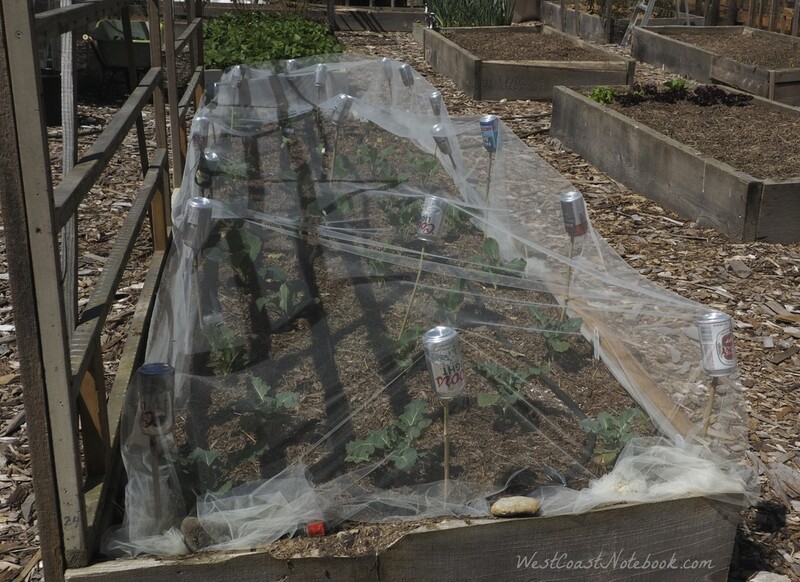 From my experience, every garden needs beer cans and bridal veils and I never knew it until this year. 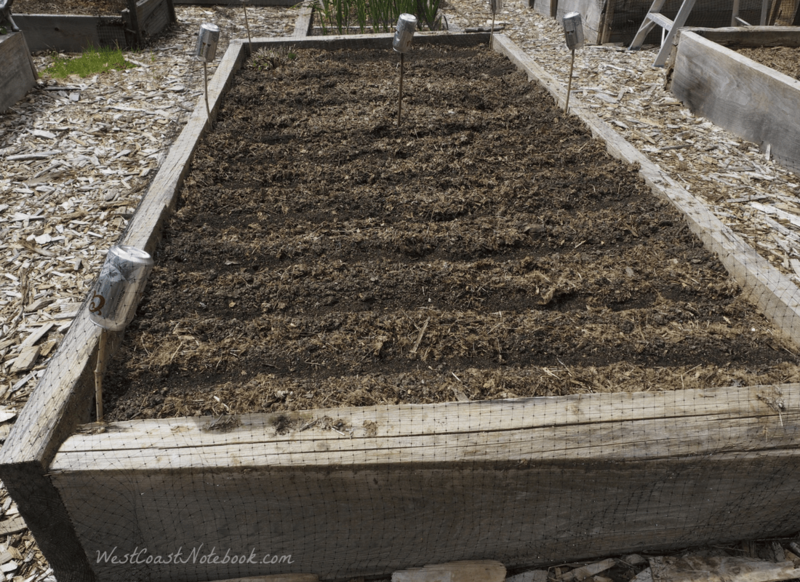 In all the years that I’ve had a garden, you would have thought that I would have tried most of the tips and tricks out there, but as in my last post (read here) there is always something new to learn. It all started with the quail. 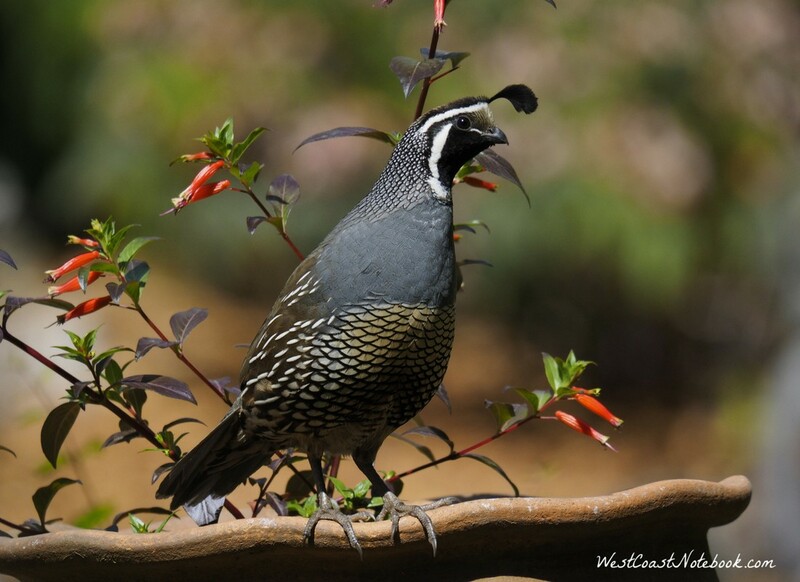 Now I love the California quail that come to my yard. 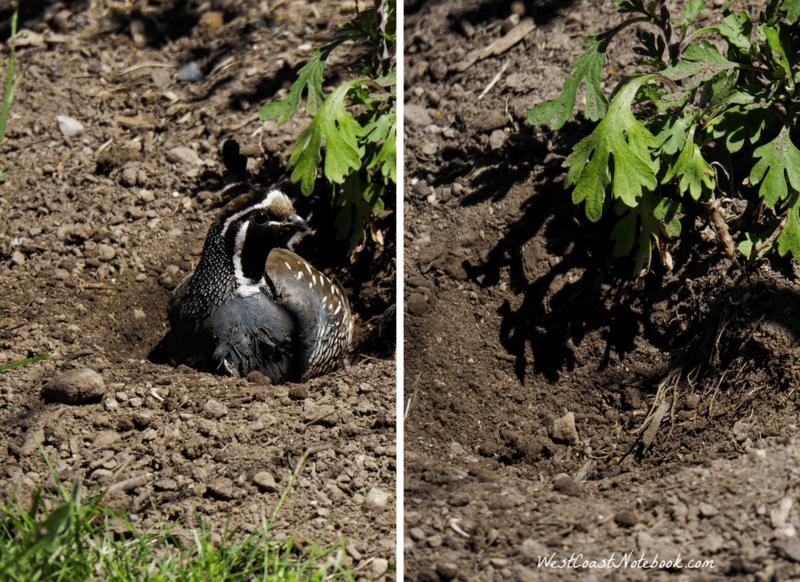 Normally he keeps guard while “she” eats and pokes around but when it comes to taking dirt baths… they are both in it together. And they prefer the soft loose soil in the garden. If you don’t keep on top of it, you will find these cozy little divets in the soil with the new seeds you just planted scattered to the wind or eaten while they preened, bathed and rested. Not being content with just one dust bath, they like them so much they will pick two or three spots to enjoy. So, one thing I’ve learned over the years it when I plant I need to put something over the garden to protect it against bathing beauties. 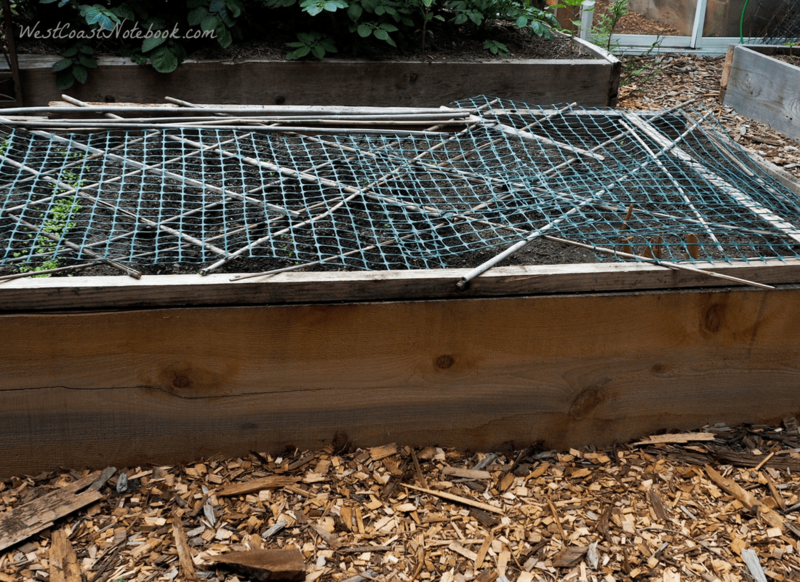 Until this year I’ve used long boards or poles to crisscross the raised garden bed and as that still leaves some holes I then put some bird netting over the top. This was sort of a stop-gap measure and it did the trick but was a bit of a pain. 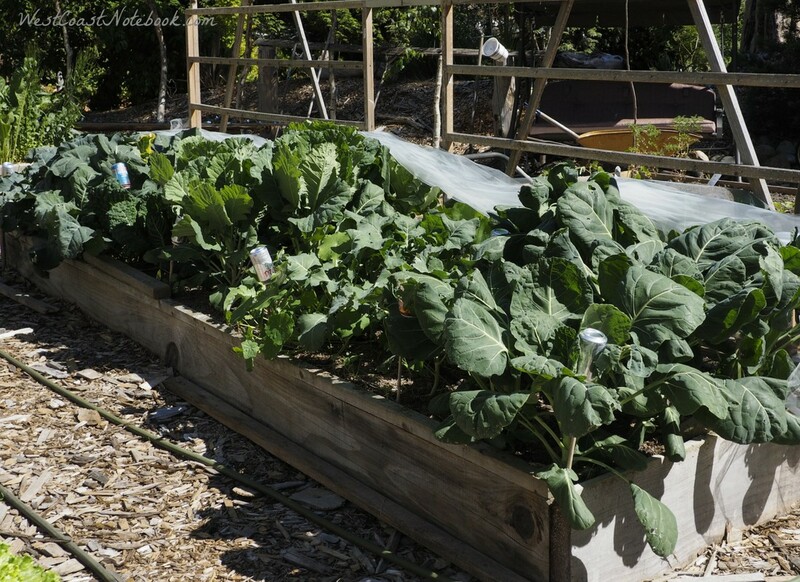 You needed to have enough boards or poles to go across all the raised beds. Wood and netting don’t mix. The netting kept catching on the wood and is hard to pull off and get underneath if one has to. You can’t raise it high enough to allow the plants to grow tall so I needed to take it off before I wanted to. I started thinking about something that the net wouldn’t catch on. My first thought was a mason or canning jar but discounted it because it seemed a little heavy. Then I thought how about a water bottle, but I didn’t have any. What I did have (thanks to Rob and friends) was a case of beer cans that were waiting to be returned to the bottle depot. They were smooth on the outside and the netting wouldn’t snag on them. Next, I looked around for something that would fit into the hole in the can and found that the teepee that I had made out of bamboo sticks last year had fallen apart and the sticks fit perfectly into the opening. 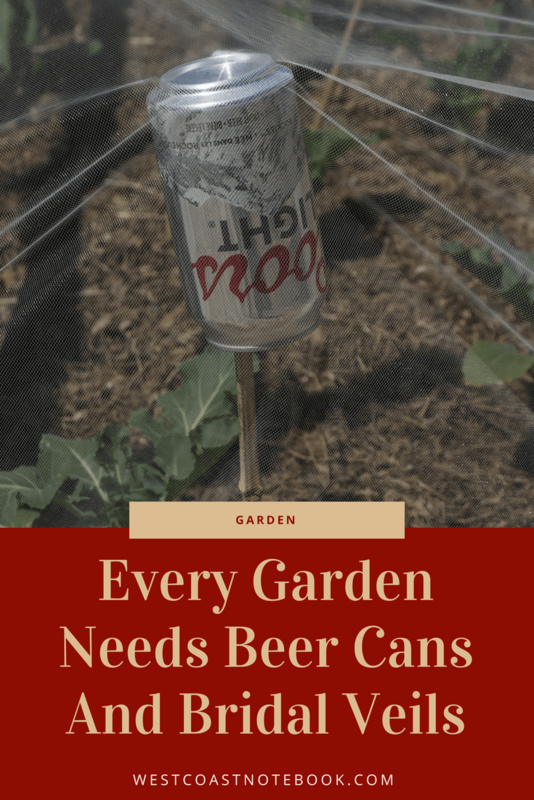 Cutting the sticks down to about 2 feet high or taller depending on what I was planting, I put the cans on the top and pushed the sticks down into the soil. Taking the bird netting I pulled it over the top of the can letting it hang down over the raised bed to completely cover the garden and if it needed holding down, did so with a rock. The net just glided over the top of the can and I have the perfect height for the plants underneath. Just a note: pop cans work just as well. 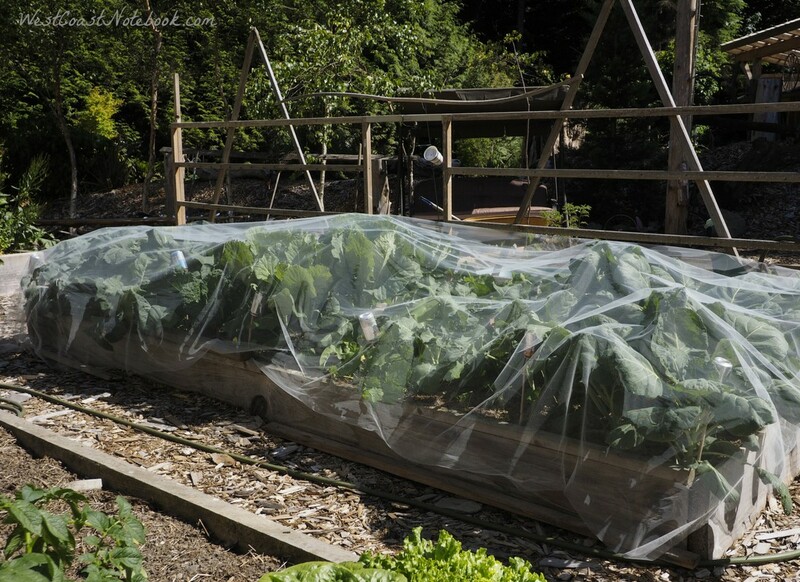 Who would have thought that using tulle (what bridal veils are made of) in your garden would be so beneficial? This again started when I had a problem that needed solving. Last year if you remember (article here) I had to take out my brassica because of root-knot but also because of a Small Cabbage White butterfly. They look harmless enough flying around the garden but the damage they are capable of doing can take out a whole crop. As they lay their eggs on the plants they hatch into caterpillars that eat their way through the brassica like candy. Worming their way even to the centre of a cabbage. Every year my crops have been invaded by this butterfly and the plants always look a little sickly as they try to grow and cope with being eaten alive. I’ve tried some natural sprays to prevent its damage but it appears that I’m not consistent enough and really… I hate spraying anything on my vegetables that I can’t pronounce. So I hunted around to find a solution to my problem. You can spend a lot of hours on the internet doing research. I phone around to some organic farms and they either used an organic spray or just let the butterflies have their way. Then I remembered my mom telling me about how my cousin puts tulle (bridal veil netting) over her plants and I thought why not give it a try. Heading down to the local fabric store (50 minutes away by car) I lucked out. If you were a member, tulle was on sale for a ridiculously low price so even with the cost of the membership I saved about $20. If I remember correctly it only cost about $14.50 to do the whole garden bed. I got a piece that was 72 inches wide so I didn’t have to put a seam in the middle and it stretched across the width of the garden. Using the same idea with stakes and beer cans the tulle was easy to pull over the top and anchor down with rocks or lengths of wood. I was worried if the rain could get through, but there isn’t a problem. Rain just goes through like a net and I think that the tulle actually helps shade the plants a little which is good as these plants prefer cool to hot. As you can see in the picture above I had just transplanted my cabbage, cauliflower, broccoli, collards and brussel sprouts into the garden and covered them. And, as I had one soaker hose, I put that into the bed as well. There was lots of room along the sides and ends for the tulle to expand as the plant expanded but I didn’t quite realize just how much they would expand. Here’s what the garden looks like less than a month later. When you look at this picture you can see I underestimated how tall the stakes should be, but that doesn’t seem to be a problem as the plants hold the tulle up. We’ve been eating broccoli and collards from the garden and all I do is to lift up the tulle and pick underneath it. Pulling back the tulle to trim some of the dead leave or ones that were sticking out on the side I could admire how well they were doing. I did some staggering with planting and you can see the low area in the picture above at this end is where the second planting was done 2 weeks later. This is the first year of all my gardening career that the brassica have ever grown this well and I’m amazed at the results. And… in case you are wondering, I’m growing scarlet runner beans right at the back of the garden bed with the trellis for support. I figure they will help shade the brassica in the hot summer heat.